As we make headway to the Federal High Court, Abuja, Nigerian government MUST provide Nnamdi Kanu [leader of the Indigenous People of Biafra]. Bear in mind that on April 25, 2017, Mazi Nnamdi Kanu was granted bail by the Court of competent jurisdiction. The order was made by Justice Binta Nyako of the Federal High Court in Abuja. Conversely, Mazi Nnamdi Kanu's "frivolous" bail was breached as the Nigerian army raided his homestead (on September 14, 2017), and made away with him. Following the dreadful foray into the home of the leader of the Indigenous People of Biafra, IPOB, (by the Nigerian army), we have not heard of his whereabouts. Hence, we are unsure whether or not he is alive. However, the Nigerian government has this question to answer: WHERE IS NNAMDI KANU? 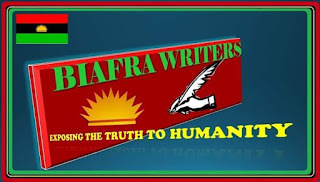 Get connected to Biafra Writers Press for LIVE updates. Chukwuemeka Chimerue and Chikwas Onu Ikpe.